Doctors and other health care professionals do not typically allow product providers to spend time with them. Gone are the days of long office visits for pharmacy and health care providers to share the latest and greatest product information with doctors and physicians. Tradeshows; however, can provide a high level of engagement and interaction from attendees because they’re taking the time to attend the shows and corresponding educational sessions to learn more. It is with this in mind that Omnicare asked 2020 Exhibits to help drive booth traffic in an engaging, high-energy, impactful way. 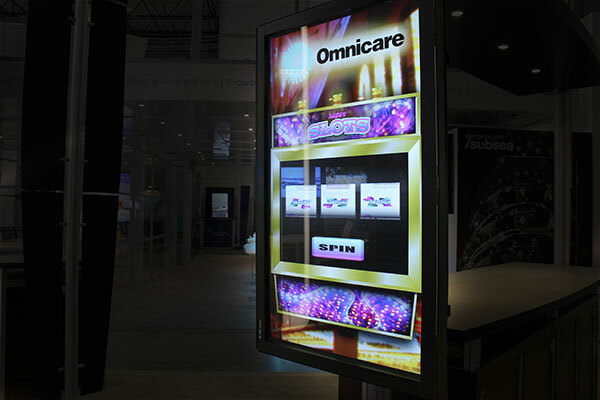 It was time to help Omnicare light up their environment and make some noise on a crowded, competitive show floor. 2020 Exhibits designed and delivered a custom-branded slot machine – the perfect attention grabber, engaging and interactive, a creative way to increase dwell-time while delivering a high-energy vibe and strong visual impact. Once in the Omnicare environment, there was a significant uptick in dwell time, leading to higher quality interactions and ultimately, resulting in more qualifying leads for Omnicare. Keenly aware of the competitive nature of the health care attendees, the Omnicare Slot Machine was pure entertainment with a dash of product branding and education (featuring product categories on the slot machine.) Fun always trumps dull and boring. Even doctors love interaction; engagement and the chance do something. From 3D animated, interactive touch screens to touch tables and motion sensitive interactive, the possibilities are endless. Is there a chance to win a prize? Even better, who doesn’t love a prize? The 2020 Exhibits tech team infused fun and excitement into the slot machine by incorporating true bells and whistles, as the wheel of products turned and landed – hopefully three across! Attendees repeatedly experienced Omnicare's product branding, reinforcing the product names through the repetitive cycles of play. In the crowded and competitive marketplace, Omnicare stood out with a fun yet educational and interactive game. Engaging attendees in an unexpected, creative way allowed the Omnicare Team to spend more time with attendees and to strengthen those connections.